We are so excited to get to know you and begin dreaming about your beautiful day! To get started, fill out the contact form to find out how we can help bring your visions to life. We would love the opportunity to sit down with you to uncover your needs and discover all your options. We can assist you at any stage of the planning process. Meetings are scheduled in advance and by appointment only. We are closed Saturday, Sunday and Monday due to events and to rest and recharge. 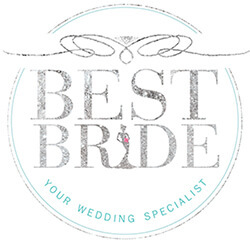 Thank you for your interest in partnering with Best Bride. in the world. We are excited to begin this journey together and always look forward in working with and promoting amazing vendors in the wedding industry. We are proud to work with vendors that allow us to provide best quality service and prices to our clients. There are several vendor partnership opportunities that are currently available. If you feel that you have a business that can collaborate with us; fill out the form and we will get back to you soon! We encourage you to share your questions, ideas and comments with us. If you can help us make a Best Bride then we love you already. Best Bride reaches an international audience of stylish and discerning wedding planning couples, and wedding professionals. Our readers care about planning weddings that honor their personalities and passions, and they're excited to learn about the best professionals and products to help them do so. If you would like more information about Banner Ads, Sponsored Posts or Giveaways on our blogs, please fill out the form. We will review your information and get back to you shortly. We have found some of our greatest team members through our internship program therefore we leave open the opportunity for finding new additions to Best Bride through motivated and passionate interns. We accept interns to assist within various departments. We look for skills and capabilities that can benefit our company. Fill out this form and email us with your resume and cover letter. All applications are kept on file, when we have an opening applicants will be taken into consideration. Thank you for your consideration in Best Bride! We love to collaborate ! For press and media inquires please fill out the form and we will get back to you soon! Why should you be given the opportunity for an internship with best Bride?